The VWR Model 1535 Incubator provides excellent temperature uniformity without hotspots thanks to an interior surrounded by heating elements. 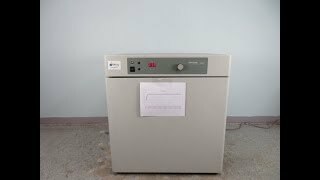 This 6.7cu ft capacity lab incubator creates a warm jacket of air in the chamber with elements at the base and top, and on the three wall sides resulting in a uniformity of ±0.25C at 37C. To help maintain this temperature and to keep from disturbing the environment, a full length tempered glass door covers the chamber, allowing users to view their samples and still maintain the atmosphere. This microprocessor-controlled incubator has an up-top digital display and membrane key pad that lets users quickly and simple set their desired temperature and features an indicator light to alert that heating is occurring. The temperature range of the VWR Model 1535 Incubator can be set between 5°C above ambient and up to 70°C. This digital incubator also features overtemperature protection through a second independent controller, with a visual alarm indicator light, a through wall access port for a chart recorder or secondary temperature probe and a vapor sealed electrical outlet inside the chamber. This VWR 1535 Incubator has been fully inspected and comes with a current temperature validation report. All of our lab equipment comes backed with our standard warranty. Should you have any questions about this or any of our other incubators, please don't hesitate to contact us.